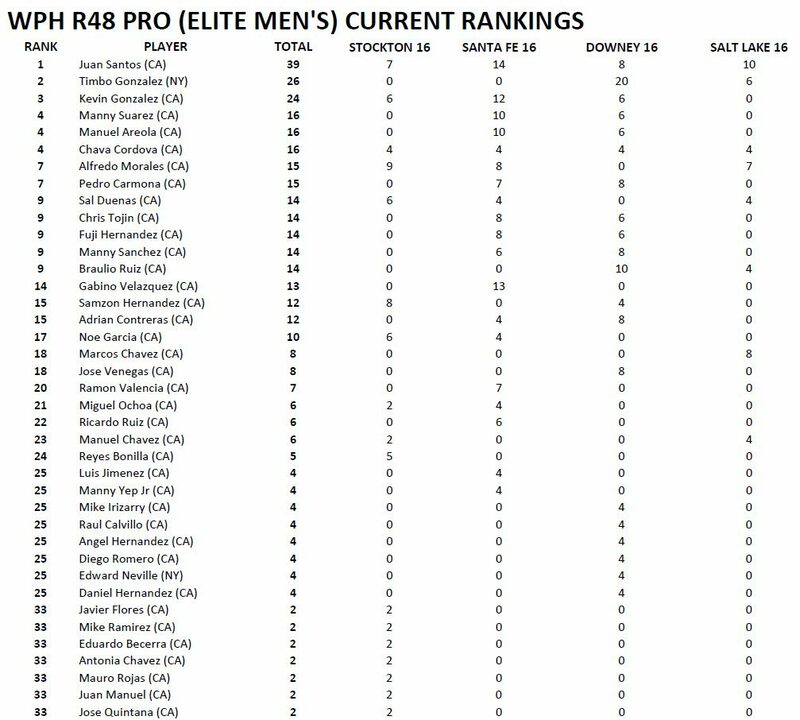 Salt Lake City, UT- 43 year old Marcos Chavez (CA) nearly stunned the young ballers with a finals win on Sunday in Salt Lake City, but Juan Santos (CA) has proven he can compete on all surfaces with a very cool 4 wall victory last Sunday (April 18th); Santos took the Nietos 3 Wall Courts Yellow 45 days ago, then followed with a 1 wall finals appearance before nabbing his first ever 4 wall crown in the land of Zion. This victory holds off the hot-moving Timothy Gonzalez (NY) who is heading to the top of the charts with a bullet after a nice showing in Salt Lake and a slam in Downey (that earned him 10 points for singles and 10 more for doubles). Although Kevin Gonzalez (CA) didn’t participate in Salt Lake City, he is still very secure at the #4 spot; meanwhile, Samzon Hernandez (CA), once a powerhouse atop the list, has faded with multiple mid-tournament no-shows or last minute un-announced absences; all of which has helped push the one time explosive machine into idle at #15.